Ripped Recipes - Fudgey Protein Bites! 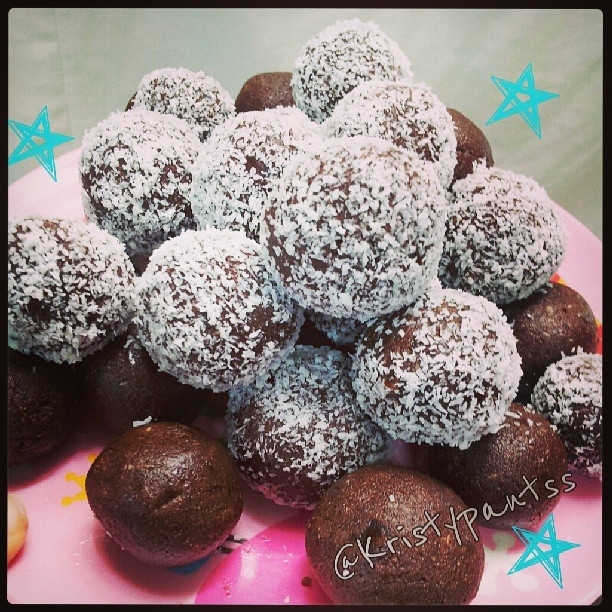 Home » Recipes » Snack » Fudgey Protein Bites! Moist, fudgey, delicious, protein treats! The perfect on the go snack. Combine all of the following ingredients in a food processor: 1 cup pitted dates (pre-soak if they are not soft. Mine didn't need soaking), 1/2 cup almond flour, 2tbsp unsweetened cocoa powder, 2 tbsp unsweetened shredded coconut, 1tbsp flax seed meal, 1tbsp coconut oil, 1tbsp raw honey, 1 scoop of whey,a splash of lemon extract to taste, and a splash of almond milk for texture. Once blended, scoop about a tablespoon of the mixture at a time and form into balls. Roll in more coconut if desired :) Enjoy!